Property Size 2,736 sq. ft. 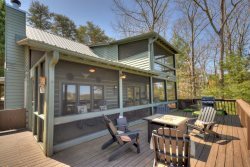 This lovely cabin retreat sits in a natural wooded setting. Spacious atmosphere and mountain decor make this the perfect place for a family vacation. Easily sleeps 10 with every bedroom having a private bathroom! This is a pet friendly cabin rental with a fantastic outside fenced area.